Close your eyes for a second and imagine crying in front of millions of people on national television. You can’t imagine it right? Who would allow their emotions to get the best of them in such a way? Well, look no further, that person in the now viral Fox News video is me, Wendy Osefo. 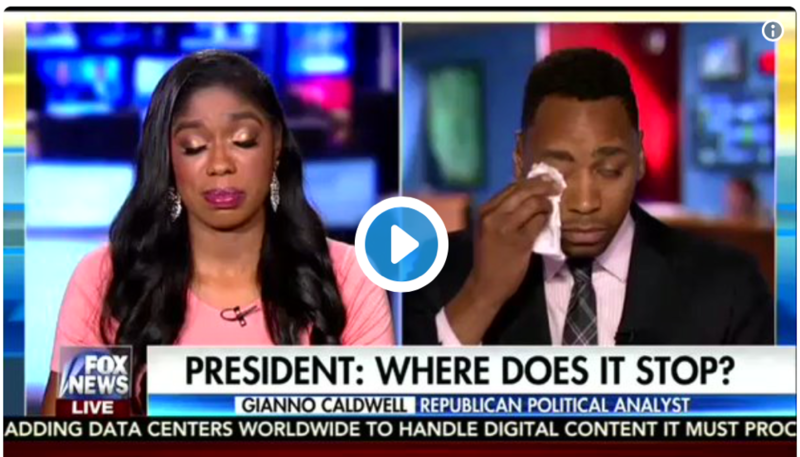 On Wednesday, Republican strategist, Gianno Caldwell and I were invited on Fox and Friends to share our thoughts on the removal of Confederate monuments. Instead, what happened took the audience and even us – the commentators – by surprise. Instead of discussing the topic of monuments, Caldwell and I decried the president’s remarks in the wake of the terror attack in Charlottesville. While this TV moment was viewed as a twinkle of solidarity where partisan talking points were thrown out the window, the symbolism and meaning of our tears ran in complete contradiction to each other. Gianno, a known Trump supporter, had emotions of betrayal by the president – a sense of letdown. My emotions, on the other hand, resulted from undeniable confirmation that our president only cares about one thing – his base. The president’s remarks or lack thereof about Charlottesville do not surprise me, but rather confirms everything I knew him to be and every reason why I do not believe he is fit for the office of the presidency. Whether we examine the way, Trump treated tenants in the 1970’s, his birther comments about Obama, or the leaked Access Hollywood tapes. One thing that became apparent to me then and remains true today is Donald J. Trump is morally bankrupt. My tears were not because I expected more, but because my assessment of Trump, his character, and ability to be president was not only accurate but spot on. My tears were not for Trump, but for all of us who have to live under his presidency for the years to come. My tears are for countless citizens of this country who are trying to make way for themselves and their families but will inadvertently be hit by the stray bullets that result from failed policies, separatist ideology, and political sword fights. My tears are for the countless people of color who will die under the loosened civil rights protection from the Department of Justice. My tears are for the next young man or young women who will start school next week only to become a hashtag in the weeks to follow. My tears do not come from the realization that we are a nation divided, my tears come instead from the indisputable confirmation of this division. My tears are for the Americans who knew his election would only be a social experiment, but now have to live under a regime that cannot use unequivocal language to denounce Nazi’s. My tears are not for Donald J. Trump; my tears are for my two sons who have to live in a country whose leader does not view them as human beings. My tears are for the country we have become. Whether it is the Fox and Friends segment or the wave of Senators opposing the Charlottesville attack, what has become apparent from the emotions expressed from both sides of the aisle is that the few strands of moral fibers we have left in this nation is on the brink of being dissolved, and it is now incumbent amongst us all to decide the title for this chapter in our history. The future of our nation is in limbo and requires leadership that can move us away from these uncertain times into a new chapter of healing. I implore us all of us to unite as a country and collectively take a piece of the leadership puzzle, because whether our tears come from a feeling of disappointment or feelings of “I told you so”, based on the events of the last week, one thing we can all agree on is that the leadership needed for this country to move forth will not be found at 1600 Pennsylvania Avenue. We have to do this alone or face the possibility of being divided by the person whose sole responsibility it is to keep us united. This, my friend, is the only path forward. Wipe your tears; we have work to do. Dr. Wendy Osefo is a Political Commentator and Assistant Professor of Education at The Johns Hopkins University. She is the former Director of Family and Community Engagement for the Obama Administration’s Anti-poverty Initiative, DC Promise Neighborhood (DCPNI). Follow her on Twitter @WendyOsefo.